El Castillo in Spanish means "The Castle". Did you know there was a castle in Nicaragua? Not only is there a castle, but it has a fun history as well. This week, our Tri-Country students are seeing and learning about this northern neighbor and its rich history which includes El Castillo. To understand why El Castillo became an important spot in Nicaragua, it's best to first view its geography on this satellite map. The students arrive at El Castillo by water taxi from Rio San Carlos - the town can only be reached by boat. The town’s name is derived from the fortress built by the Spanish in 1675 with the idea of protecting its colonial cities inland from pirates and other countries by blocking the river. It was built on a hill on the shores of the San Juan River, which connects Lake Cocibolca with the Caribbean Sea. This route was used on various occasions by pirates to attack Spanish settlements bordering the river. The most precious Spanish city of that time, Granada, was also attacked several times. Now let's get down to the fun history. When Britain and Spain clashed in Central America during the 18th century, control over the San Juan River and Lake Nicaragua was one of the great prizes in their conflict. 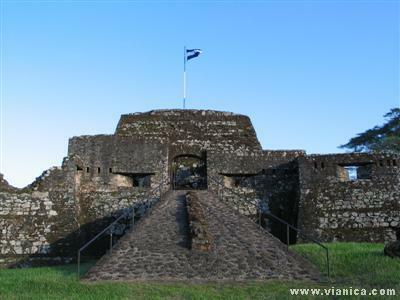 Any conquering force needed first to capture the fort at El Castillo, and in 1762 the British mounted an attack that was thwarted by a woman's valor. Britain did not give up easily, however. In 1780, a flotilla set out from Jamaica for a second assault on El Castillo. Among the leaders was Horatio Nelson, then a young captain. British troops cut the fort's water supply, besieged it for 17 days and finally seized it. But the British force was ravaged by disease and overwhelmed by rain, which falls here at the rate of 200 inches a year. So weakened that survivors could not muster enough strength to bury their dead, the British were unable to advance and extend their power into the heart of Central America. Spain's hold on the region was secure. Semester students get more than just outdoor adventure, animal photography and language; they learn why not to mess with women with cannons. We professional types pronounce "WFR" as "woofer". The WFR, or Wilderness First Responder, is a certification combining the Emergency Response Certification with additional hours of curriculum and practice for application in the wilderness setting. The ERC (a 48-hour DOT course certification) is required for police, athletic trainers and firemen in the USA, and it is administered by the American Red Cross (ARC). Due to the remote nature of our courses our lead field staff are required to have successfully completed the WFR course. Certification from ARC and CRROBS is valid for 3 years. The most interesting parts for the students as well as the instructors are the practical scenarios in which people pretend to be hurt, bleeding, broken, and distressed. The students in training must assess the situation an react quickly and reasonably. All Leadership students and CRROBS instructors must take this course, which is quite rigorous. When asked about the training, the students generally say it was "stressful, but interesting and beneficial." See photos of Leadership Fall 2009 Semester students during WFR Training on our Facebook fan page. It's a bird. It's a raft. It's Tejas. This is no ordinary vida lata (literally meaning "life out of a can", or "mut" as we say in English). Tejas has been an adventure enthusiast since the day our new Program Director, Laura Statesir, adopted her four and a half years ago as a scruffy homeless puppy in the Dominican Republic. Tejas has lived in three countries: Dominican Republic, the USA, and now Costa Rica. Even though she only sees out of one eye (due to a sling shot incident by some local kids in the DR), she has rappelled in the Salto de Jimenoa Waterfall in the Dominican Republic, whitewater kayaked in the Rio Yaque (also in the DR), hiked the active Volcán Turrialba (here in Costa Rica), and camped and hiked the Pisgahs in North Carolina. When she wasn't on an adventure trip, she was riding a motorcycle around the DR. While she may have a lot to flaunt in front of our other pets (and us, for that matter) as the newest addition to our Costa Rica Outward Bound animal family here on base, Tejas fit in immediately. She is relaxed and loves trash. She has a unique Spanish name (named after Laura's home state, Texas, which coincidentally is the same word used for the red roof tiles so common here in Latin America). And of course, it is only fitting that an adventure dog live at an adventure school. Packing List: What's a Gaiter? a covering of cloth or leather for the ankle and instep and sometimes also the lower leg, worn over the shoe or boot. One of the most important items on our CRROBS packing list for our hikers is a pair of gaiters. The majority of incoming students - and their parents - have never heard of them. I am one of those people. Donna White, one of our veteran and most beloved land instructors, has fully explained what is required of a gaiters purchase and why they are so detrimental to a hiking experience in the rainforest. Watch this video in which Donna demonstrates how to wear gaiters and how they remarkably help our jungle hikers. Do you need to purchase some? Click here to find a multitude of options where you can find the best gaiters for you. This week we sent our Water & Wave and Tri-Country students out to Rio Pejibaye to get a taste for what it takes to be a river guide. They will have two days of training in WRT, Whitewater Rescue Technician, while our Leadership students receive the full certification. What does it take to be Rescue 3, WRT-certified? The course concentrates on advanced water rescue skills for river guides and professionals, including managing the rescue scene, litter management and the utilization of teams. 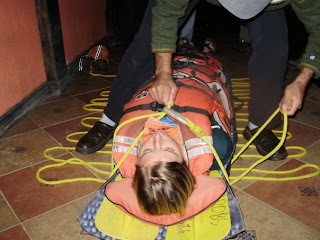 Costa Rica Outward Bound students get their training and certification through reputable Rescue 3 International. Four days of training, practice, experience and testing are required to obtain that coveted certification card. All CRROBS rafting instructors have not only been certified by Rescue 3 International's WRT program, but they renew this certification once a year. They run so many rivers and have so much valued experience, in fact, that the International Rafting Federation (IRF) has asked them to help structure and standardize its training program. An article explaining this series of standardization seminars (taking place on CRROBS base) will be posted in the upcoming week.